WTS offers an array of article delivery and research services to individuals and organizations not affiliated with the University of Wisconsin or who need the specialized skills of WTS staff in locating and retrieving information. It is the policy of WTS to keep confidential all material submitted by clients with respect to searches as well as search results. WTS will not disclose material pertaining to searches to third parties except as required by law. Services include providing copies of articles, book chapters, conference papers, abstracts, and government documents, among others. Articles are sent as PDFs via email links. Faxed or mailed copies are available upon request. WTS provides materials from the University of Wisconsin-Madison's extensive collections and our staff are experts at finding materials from sources around the world. WTS can pay copyright royalties on clients’ behalf, usually through the Copyright Clearance Center. If you’d like to know the copyright cost before you submit a request, please search the CCC website. WTS advises clients that materials they request may be protected under United States Copyright Law (Title 17 U.S. Code), which governs the making of photocopies or other reproductions of copyrighted materials. Clients are solely responsible for determining their obligations under copyright law. If a client determines that a copyright royalty payment is owed for a copy made by WTS, the client may make the payment or may request that WTS make the payment through the Copyright Clearance Center and bill the client. Occasionally, the CCC will report that it is unable to obtain permission to forward a copyright royalty payment to the publisher. In this case, the client will be notified and may wish to contact the publisher themselves in order to determine if copyright royalty is due. Articles downloaded from electronic collections require copyright royalty payments. Increasingly, libraries are canceling print subscriptions and are only providing access to journals through electronic collections. We have licensing agreements with some publishers to allow WTS to download their content on behalf of our clients. In all of these cases, copyright royalty payments are required. 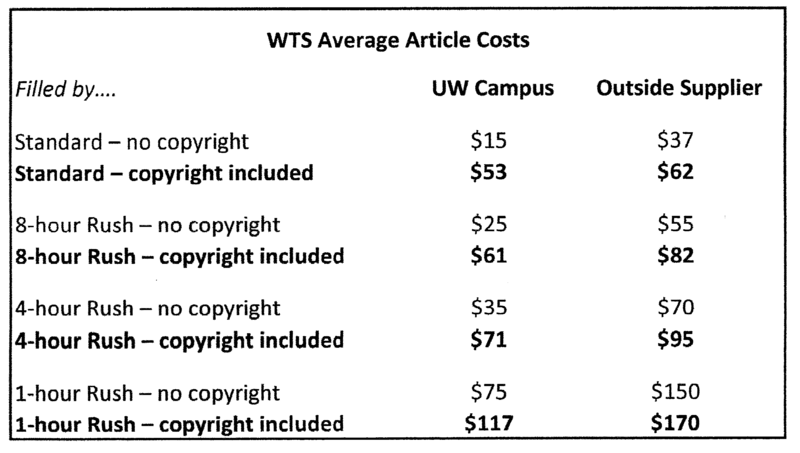 Prices for copyright are set by the publishers and can vary considerably; $35 to $50 is typical, but some publishers charge as much as $50 per page. WTS makes every effort to alert clients to potentially expensive material. However, if clients are concerned about high copyright fees they can check the CCC for prices, or they can set a max cost per article on our web form and staff will notify them if the cost exceeds their limit before providing the article. Please note that copyright royalties must be paid when more than one article or chapter is copied from the same work (book, journal issue, etc, ) or when more than 50% of a work is copied. Orders sent to WTS are considered firm orders. WTS cannot guarantee that orders can be cancelled without incurring a 20% fee per citation/request. Large orders (over 50 citations) may incur a minimum $200 research fee to cancel the order. WTS loans books owned by UW-Madison libraries. Our book loan service is made possible by borrowing privileges granted by the libraries of the UW-Madison, and our ability to continue to provide loans is dependent on maintaining the goodwill of the lending libraries through prompt return, in good condition, of borrowed materials. WTS cannot loan any items that do not circulate from the collection or that are rare or fragile. Books are loaned for 60 days, no renewals. Books cannot be loaned internationally. We do not provide third-party loans. Books are shipped via UPS Next Day Air or FedEx Priority Overnight unless instructed otherwise. WTS librarians can help you locate scientific, technical, and biomedical information. If you need a list of articles on a particular topic or would like to stay up-to-date in your field, we can search numerous databases, including Chemical Abstracts, Medline, Engineering Index, Embase, and many more. We can also help with preliminary patent research. Please note that we are unable to provide competitive intelligence or marketing research. If you’d like to submit a research request, please log in and fill out our Order form, and select Research instead of Article Delivery. WTS can provide dictionary definitions, library date stamps, tables of contents, and other work on information projects. Please note that there may be charges for the search regardless of outcome. Feel free to submit your request on our web form or contact us if you have questions about what we can do for you.